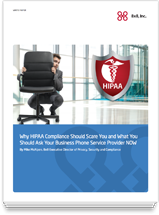 Healthcare organizations and physician practices are under immense pressure to comply with regulations, ensure the security of personal data and keep costs low. Eastern DataComm understands these unique needs, and our communication and business phone system solutions address the challenges of convenience, compliance, and 24/7 reliability. Want to reduce patient no-shows by thirty percent? Patient no-shows are a fact of life for medical practices, and they can have a big impact on your bottom line. In fact, appointment abandonment rates average over 30%, reducing revenue by as much as $411 a day per physician. With the right communications tools powering your healthcare facility, you’ll free up doctors, nurses and support staff to spend time where it counts: on patient care, not on struggling to gain access to the right data, making outbound appointment calls, or waiting for programs to load. Our integrated communications technology delivers appointment and Rx reminders, assists with completing forms and more. It can even respond to routine patient questions. That’s a big advantage for your patients and your practice. Improve the health of your medical practice, hospital, extended care facility and pharmaceutical firm’s communications with our NJ VoIP phone systems. With almost 30 years of industry expertise and working with physician practices and healthcare organizations, Eastern DataComm provides unique insight into the underlying network and infrastructure needs of your organization, as well as the solutions that run on top of it. ShoreTel is a leading provider of brilliantly simple unified communications (UC) products, cloud services, contact centers and IP phone systems. 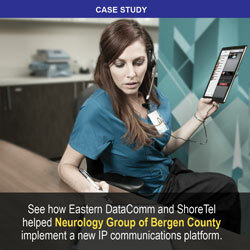 More than 1,000 practices partner with ShoreTel to improve practice performance in three key areas: patient engagement, staff collaboration and practice workflow. "With over 12 highly staffed Medical facilities each with distinguished phone systems, I recommended a ShoreTel as the direction for voice standardization. Working with Eastern DataComm my recommendation turned out to be the right one. Along with its portability and eliminating the need to contact a vendor for adds, moves and changes, the ease of managing each system has definitely made it a worthwhile investment. Eastern DataComm has been there every step of the way."